Posted on Tue, Mar 13, 2012 : 3:31 p.m.
Gov. Rick Snyder signed a law Tuesday that prohibits graduate student research assistants from unionizing, thwarting a yearlong mobilization effort by a group of University of Michigan student researchers. 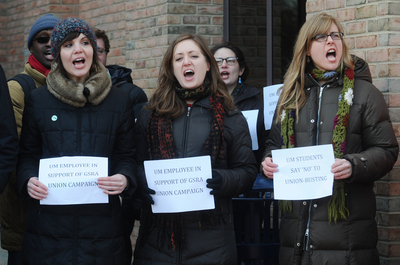 Supporters of GSRA unionization chant at a recent press conference. The law says a GSRA "is not a public employee entitled to representation." The U-M Board of Regents voted 6-2 in May to consider student researchers employees and gave GSRAs the green light to vote to form a union. The regents' decision has been opposed by several U-M administrators, faculty and state politicians, including Attorney General Bill Schuette, who contend GSRAs attend U-M to learn and that to treat them like employees would compromise academic integrity. After the regents' May decision, GSRAs needed approval from the Michigan Employment Relations Commission to form a union and have been in the midst of a hearing since February. The legislature's ban effectively puts an end to that review. "This is an extraordinary move. I don’t think anybody would argue with that," said Victor DiRita, a U-M microbiology professor and associate dean of graduate and postdoctoral studies, who testified in support of the bill before the House. "The bill is simply trying to reboot the whole understanding of what graduate students are in light of the fact that our regents have left us high and dry on this," DiRita continued. "Regents made a terrible mistake by determining out of the blue that graduate students are actually employees." Liz Rodrigues, a U-M graduate student instructor and representative of the Graduate Employees Organization, a group that's been advocating for GSRA unionization, said the bill is an inappropriate intervention into an issue that should be decided by MERC. “This bill has disrupted the due process that was under way at MERC,” Rodrigues said. "GSRAs don't feel like they got their day in court and are disappointed that the campaign will not end in a vote for everyone to decide but rather in this legislative maneuver." Stephen Raiman, a GSRA and head of the U-M group Students Against GSRA Unionization, disagreed. Raimain said current Michigan law on who could and could not be considered an employee —a central issue of dispute between those who support and oppose GSRA unionization— "needed clarifying." "It is the legislature's job to set policy and that's what they did," he said. After signing the House Bill 4246 Tuesday morning, Snyder conceded that GSRAs "provide valuable efforts for universities" but said "they are students first and foremost" and that "considering them to be public employees with union representation would alter the nature of the critical relationship between students and teachers." Rodrigues contended the issue was less academically based and more politically driven. GEO plans to join larger statewide union efforts to put a constitutional amendment on the ballot in November that would guarantee all Michigan workers the right to unionize. If the initiative receives the roughly 322,600 signatures necessary and if the amendment passes in November, GEO believes the legislature's recent ban on GSRA unionization will be subject to repeal. Either way, both sides said they expect the issue will not go away anytime soon. "I have no illusion that the bill today is ending this," DiRita said. "In some measure we’re going to keep having this discussion." Wed, Mar 14, 2012 : 1:35 p.m.
Keeping govt out of our lives? Yet another slogan from our GOP that turns out to be nothing but propaganda. Wed, Mar 14, 2012 : 11:15 a.m.
As a true conservative, I oppose this law. Another unnecessary and possibly unconstitutional government intervention. We need fewer laws and more common sense. Wed, Mar 14, 2012 : 1:34 p.m.
You are a dying breed, Bob. I miss the Jack Kemps and Bill Buckleys of the world. Wed, Mar 14, 2012 : 9:51 a.m. There is some misinformation out there, so hopefully this will clear some of it up. 1) GSRAs are students, and they do take classes. All graduate level programs at Michigan require coursework in some form or another. They also conduct research, usually in direct support of their chosen thesis or a related topic. This research also benefits their professor/adviser, but the students have the choice of their adviser. If they do not like the research or work environment required by a particular adviser, they are under no obligation to be a GSRA for them. They can find a new adviser to support them, or can pay their own tuition and living expenses. 2) Being a GSRA is not fundamentally different from being supported by the better scholarships or fellowships available. In my office all graduate students pursue the same level and type of activities, regardless of the source of their funding. On the opinion side, I am glad that my fellow graduate will not be unionizing. However, it would have been nice to see them make this decision for themselves, though I have no faith that the misleading tactics of the GEO would have allowed a fair vote. This issue was never about rights, it was about a union looking to raise more dues. Wed, Mar 14, 2012 : 1:33 p.m.
Nice to see that you have so much respect for the grad students at a major university, and their complete inability to reason through &quot;misinformation&quot;. If you can't trust them to do that, why trust them to do good science? Wed, Mar 14, 2012 : 10:25 a.m. Thank you Morgan. This comment was clearer than the entire AA.com article it was in reference to. Wed, Mar 14, 2012 : 6:09 a.m.
Gotta love those Republican lawmakers........NOT. Wed, Mar 14, 2012 : 5 a.m. So working at a public institution, and getting paid a paycheck by that public institution, getting a W-2 from that public institution makes you an employee ..... but not a public employee. I get it. No, I really don't get it. I guess I should have inhaled more! I thought working at a public institution made you a public employee, but I guess not in Snyder-land. So much for small government republicans. The recall attempt starts in May and the statewide effort to put a constitutional amendment on the ballot in November guaranteeing the right to unionize will begin collecting signatures soon as well. Wed, Mar 14, 2012 : 1:31 p.m.
What do you expect from a group of people that constantly whine about keeping government out of our lives, keeping local control and personal responsibility...then go on to pass multiple laws restricting local control and removing peoples personal choices? Do you honestly expect some sort of logical reasoning? Do you think they are going to have consistency in their &quot;logic&quot;? Please! this is about union busting, ideology, period. Wed, Mar 14, 2012 : 12:04 p.m.
Because republican partisan votes in Lansing took away the rights of people to vote on collective bargaining issues, so a ballot initiative will give citizens the right to vote and make their will law. Wed, Mar 14, 2012 : 6:56 a.m. Wed, Mar 14, 2012 : 2:01 a.m.
Students take classes and study, employees work for pay. RAs don't take classes, and they work for pay (typically less than minimum wage), therefore they are students. There is no reason for those who develop the technology that enables our modern standard of living to be able to defend themselves from abusive PIs who steal due credit for their work, or coerce them into working such long hours that their salary amounts to less than minimum wage. There are many dumpsters in Ann Arbor. Some have food... some have stained mattresses. So stop whining and go live in them. Wed, Mar 14, 2012 : 9:59 a.m.
GSRAs DO take classes, and the stipend computes to about $25 an hour for the research they are conducting. Coursework is on their own time.Don't forget to mention the free tuition and health insurance too. If their PI is abusive then the Michigan has multiple avenues to resolve the situation. GSRAs are not victims or stooges of the corporate world, they are attending college for an education. Wed, Mar 14, 2012 : 2:43 a.m.
How NOT to write a Syllogism: Students take classes and study, employees work for pay. RAs don't take classes, and they work for pay (typically less than minimum wage), therefore they are students. Wed, Mar 14, 2012 : 1:52 a.m.
"This bill has disrupted the due process that was under way at MERC," Rodrigues said. &quot;GSRAs don't feel like they got their day in court and are disappointed that the campaign will not end in a vote for everyone to decide but rather in this legislative maneuver.&quot; Due process? GEO keeps pestering MERC until they roll over to get them to go away? On whose dime? Time to end it. Not a fan of the legislature doing it but--as for GEO--I guess you use the tools available. I suspect the AFT will be calling in its markers from GEO. Wed, Mar 14, 2012 : 1:35 a.m.
Looks like a perfect example of why the proposed constitutional amendment is needed. If you're paid by the University, you're an employee. Now the Legislature has shown that they can legislate away your right to organize. Wed, Mar 14, 2012 : 1:28 p.m.
MAALEN, the new law says that the GSA'a may not organize a union. Wed, Mar 14, 2012 : 6:53 a.m.
@John Q, I am paid by organizations, individuales but that does not make me an employee just because I am paid by them. Before you chime in, understand the facts. Please tell us how they are legislating workers from organizing. Any worker can organize. Tue, Mar 13, 2012 : 11:07 p.m.
Well that's fine, so now they also won't have to work on research that Pfizer and other pharma and chem companies use for for-profit purposes, right? Tue, Mar 13, 2012 : 10:22 p.m. Thank god. The last thing we need is more people to feel entitled before they've ever left school. Tue, Mar 13, 2012 : 9:11 p.m.
"This bill has disrupted the due process that was under way at MERC," Rodrigues said. &quot;GSRAs don't feel like they got their day in court and are disappointed that the campaign will not end in a vote for everyone to decide but rather in this legislative maneuver.&quot; The MERC ruled in 1981 that GSRAs were students, not public employees. The MERC again ruled last August (<a href="http://www.michigandaily.com/news/merc-denies-gsras-unionization-rights)" rel='nofollow'>http://www.michigandaily.com/news/merc-denies-gsras-unionization-rights)</a> that GSRAs weren't public employees. The GEO appealed this ruling and this is what the bill has interrupted. I'd say that the GEO has had the chance to make their case. The adjoining headline: &quot;University of Michigan graduate programs ranked among top in nation&quot;. People trying hard to get in, and doing well when they are here. No union required. Tue, Mar 13, 2012 : 8:46 p.m.
Union supporters are already out gathering signatures for the constitutional amendment. Please educate yourself and acquaintances before signing! Wed, Mar 14, 2012 : 4:47 p.m. Indeed - educate yourself on the need for unions, and the continuous assault laid upon them by the wealthiest of the wealthy! Tue, Mar 13, 2012 : 8:42 p.m.
&quot;to treat them like employees would comprise [sic] academic integrity&quot; We wouldn't want that. Tue, Mar 13, 2012 : 8:31 p.m.
Kudo's to the Rickster and the Republicans who want less government intervention in a citizens life. Tue, Mar 13, 2012 : 8:18 p.m. Sounds like a Bill of Attainder to me. Wed, Mar 14, 2012 : 1:50 p.m. I think United States v. Brown would be the closest case. Congress passed a law that prohibited members of the Communist Party from serving as executive board members for any labor union. The Supreme Court said that a statute which inflicts its deprivation upon named or described persons or groups constitutes a bill of attainder whether its aim is retributive, punishing past acts, or preventive, discouraging future conduct. Basically, there was no reason to prevent Communists from holding union posistions other than Congress's desire to punish them - nothing else distinguished Communists from other people who wanted to serve as union executives. The graduate students can make the same argument here - there is really nothing different between them and other groups of workers who desire the right to join a union, except that the legislature wants to single them out and punish them. Wed, Mar 14, 2012 : 1:41 a.m.
Tue, Mar 13, 2012 : 8:01 p.m.
&quot;Workers&quot; have the right to unionize in Michigan. Nothing that the State is doing has any impact on the right to unionize. The people who don't have rights are those who want to work without having to join a union or pay dues to a union. Those are the people that need to be able to &quot;vote&quot; by either joining a union if they believe it benefits them or not joining a union if they believe it doesn't help. The path that unions are taking -- a constitutional amendment to prohibit &quot;right to work&quot; -- is the latest union attempt to control workers and prevent them from exercising their rights. It is a heavy-handed, thuggish, approach to protecting unions when unions can't demonstrate their value to currently &quot;unorganized&quot; workers. The GSRA issue is separate because it turns on the definition of who is and who is not an employee. The MERC has previously settled this question. The new State law codifies that long-standing administrative decision. I personally believe that unions can demonstrate value to workers and employers if they will stop their protective approach and adopt a new paradigm. If a union can demonstrate that it will provide a continuously trained work force, that is on time, ready for work, and is self-disciplined, they will be welcomed with open arms by business and workers alike. The union should take on the task of assuring that all training is provided and maintained as up to date, that drug and alcohol testing is done, and that required discipline for failure to meet high standards is handled. Do this and business can do away with most of the contentious issues related to contracts and daily supervision other than specific task direction. I believe a business would pay for this service the way they do for contract and temporary help and unions would have a whole new growth opportunity. Wed, Mar 14, 2012 : 1:26 p.m.
And the GSA's will never get the opportunity to meet your criteria. Tue, Mar 13, 2012 : 7:57 p.m.
Tue, Mar 13, 2012 : 7:54 p.m.
Where does the unionization of graduate student research assistants fall on the list of urgent needs facing the state of Michigan? This is an underwhelming accomplishment for our legislators and Governor. Political expediency trumps public priorities every time.